Lineage. Constituted as 335 Fighter Squadron on 22 Aug 1942. Activated on 12 Sep 1942. Redesignated as 335 Fighter Squadron, Single Engine, on 20 Aug 1943. Inactivated on 10 Nov 1945. Activated on 9 Sep 1946. Redesignated as: 335 Fighter Squadron, Jet Propelled, on 23 Apr 1947; 335 Fighter Squadron, Jet, on 14 Jun 1948; 335 Fighter-Interceptor Squadron on 20 Jan 1950; 335 Fighter-Bomber Squadron on 8 Mar 1955; 335 Fighter-Day Squadron on 25 Apr 1956; 335 Tactical Fighter Squadron on 1 Jul 1958; 335 Fighter Squadron on 1 Nov 1991. Assignments. 4 Fighter Group, 12 Sep 1942-10 Nov 1945. 4 Fighter (later, 4 Fighter-Interceptor; 4 Fighter-Bomber, 4 Fighter-Day) Group, 9 Sep 1946; 4 Fighter-Day (later, 4 Tactical Fighter) Wing, 8 Dec 1957 (attached to HQ Tactical Air Command, 1 May 1960-22 Nov 1961; Seventeenth Air Force, c. 16 Nov 1964-21 Feb 1965; 6441 Tactical Fighter Wing, 3 Jul-c. 6 Nov 1965; 355 Tactical Fighter Wing, c. 6 Nov-6 Dec 1965; 354 Tactical Fighter Wing, 4 Dec 1969-c. 25 May 1970; 8 Tactical Fighter Wing, 6 Jul-22 Dec 1972; 86 Tactical Fighter Wing, 2 Sep-2 Oct 1978 and 28 Aug-29 Sep 1979; Tactical Fighter Wing Provisional, 4, 27 Dec 1990-12 Mar 1991; Tactical Fighter Wing Provisional, 4404, 13 Mar 1991-); 4 Operations Group, 22 Apr 1991- (remained attached to Tactical Fighter Wing Provisional, 4404 until 27 Jun 1991). Stations. Bushey Hall, England, 12 Sep 1942; Debden, England, 29 Sep 1942; Steeple Morden, England, c. 23 Jul-4 Nov 1945; Camp Kilmer, NJ, 9-10 Nov 1945. Selfridge Field, MI, 9 Sep 1946; Andrews Field (later, AFB), MD, 26 Mar 1947; Langley AFB, VA, 1 May 1949; Andrews AFB, MD, 13 Aug-11 Nov 1950; Johnson AB, Japan, 13 Dec 1950; Suwon AB, South Korea, 1 May 1951; Kimpo AB, South Korea, 24 Aug 1951; Johnson AB, Japan, 20 Sep 1951; Kimpo AB, South Korea, 4 Nov 1951; Chitose AB, Japan, c. 26 Nov 1954-8 Dec 1957; Seymour Johnson AFB, NC, 8 Dec 1957- (operated from Eglin AFB, FL, 1 May 1960-22 Nov 1961; McCoy AFB, FL, 21 Oct-29 Nov 1962; Incirlik AB, Turkey, 16 Nov 1964-21 Feb 1965; Yokota AB, Japan, 3 Jul-c. 6 Nov 1965; Takhli RTAFB, Thailand, c. 6 Nov-c. 8 Dec 1965; Kunsan AB, South Korea, 4 Dec 1969-c. 25 May 1970; Ubon RTAFB, Thailand, 6 Jul-22 Dec 1972; Ramstein AB, Germany, 2 Sep-2 Oct 1978 and 28 Aug-29 Sep 1979; Al Karj AB, Saudi Arabia, 27 Dec 1990-24 Jun 1991). Aircraft. Spitfire, 1942-1943; P-47, 1943-1944; P-51, 1944-1945. P-47, 1947; P-80, 1947-1949; F-51, 1948-1949; F-86, 1949-1958; F-100, 1958-1960; F-105, 1959-1966; F-4, 1969-1989; F-15, 1990-. Operations. Combat in European Theater of Operations (ETO), Oct 1942-Apr 1945. Fighter aircraft escorted first bombing raid over Berlin, Mar 1944. On 21 Jun 1944, escorted bombers in the first shuttle bombing mission from England to Russia. Received a Distinguished Unit Citation (DUC) for destroying enemy aircraft and attacking air bases, 5 Mar-24 Apr 1944. In 1947 received jet aircraft; performed at air shows around the US; began night flying. Combat in Korea, Dec 1950-Jul 1953. Received second and third DUCs for combat in Korean War, 22 Apr-8 Jul 1951 and 9 Jul-27 Nov 1951. In World War II and Korea combined, the 335th earned more aerial victories than any other squadron. Combat in Southeast Asia, Nov-Dec 1965 and Jul-Dec 1972. During the 1980s, trained in combat readiness in order to maintain worldwide commitment and mission capability in air-to-air events. Combat in Southwest Asia, Jan-Feb 1991. 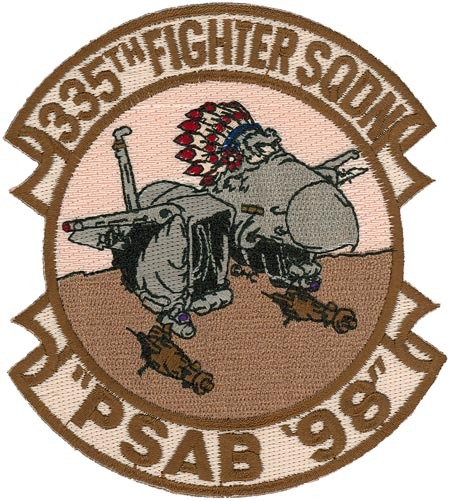 From 1990-1994, shared quarterly rotation duties to Southwest Asia with 334 and 336 FS. Since 1991, trained as combat-ready fighter squadron prepared for rapid worldwide deployment of fighter aircraft to accomplish air-to-ground, air-to-air, strategic attack and deep interdiction missions. Campaign Streamers. World War II: Air Offensive, Europe; Normandy; Northern France; Rhineland; Ardennes-Alsace; Central Europe; Air Combat, EAME Theater. Korea: CCF Intervention; First UN Counteroffensive; CCF Spring Offensive; UN Summer-Fall Offensive; Second Korean Winter; Korea Summer-Fall, 1952; Third Korean Winter; Korea, Summer 1953. Vietnam: Vietnam Defensive; Vietnam Ceasefire. Southwest Asia: Defense of Saudi Arabia; Liberation and Defense of Kuwait; Southwest Asia Ceasefire. Decorations. Distinguished Unit Citations: France, 5 Mar-24 Apr 1944; Korea, 22 Apr-8 Jul 1951; Korea, 9 Jul-27 Nov 1951. Air Force Outstanding Unit Award with Combat “V” Device: 8 Jul-20 Oct 1972. Meritorious Unit Award: 1 Jun 2008-30 Apr 2010. Air Force Outstanding Unit Awards: 1 Jul 1967-30 Jun 1968; 16 Sep 1973-15 Apr 1974; 22 Nov 1974-31 Dec 1975; 2 Feb 1976-18 Apr 1977; 1 Jun 1982-31 May 1984; 1 Jan 1987-30 Jun 1988;1 Jul 1989-22 Apr 1991; 23 Apr 1991-31 Mar 1993; 1 Apr 1993-15 Jul 1994; 16 Jul 1994-31 May 1996; 1 Jun 1998-31 May 2000; 24 Mar-10 Jun 1999; 1 Jun 2000-31 May 2002; 1 Jun 2002-31 May 2003; 1 Jun 2011-31 May 2012. Republic of Korea Presidential Unit Citations: 1 Nov 1951-30 Sep 1952; 1 Oct 1952-31 Mar 1953. Republic of Vietnam Gallantry Cross with Palm: 3 Aug-31 Dec 1972. Emblem. Approved on 7 Nov 1958.